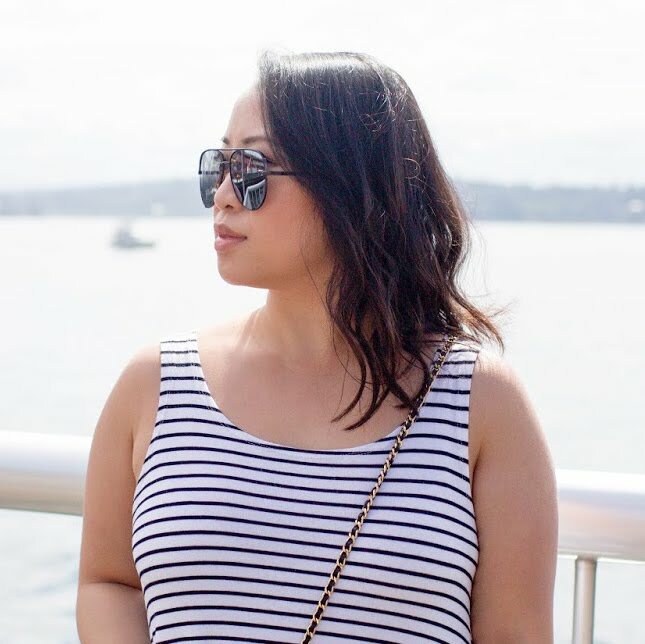 If you haven't noticed already, I'm mixing metals with both gold and silver! *gasp* Yep! My gold F21 necklace with silver Tiffany & Co heart tag earrings to go along with a Hello Berry mini smoothie bracelet that is grey with gold chain. I always thought growing up that you can never mix gold and silver together. It was either you wear all silver or you wear all gold and that was that. It was almost like a fashion faux pas.. BUT that's all a myth and in the past because now a days, I'm seeing it more on fashion blogs and in general. So when I bought this Hello Berry bracelet, I knew it would go nicely with soft colors such as this OOTD - a peach top and white shorts to wear with gold or silver or BOTH! If there's anything I still won't and just can't do is mix metals! But after this, maybe I will change my mind. i am lovin this outfit lady! 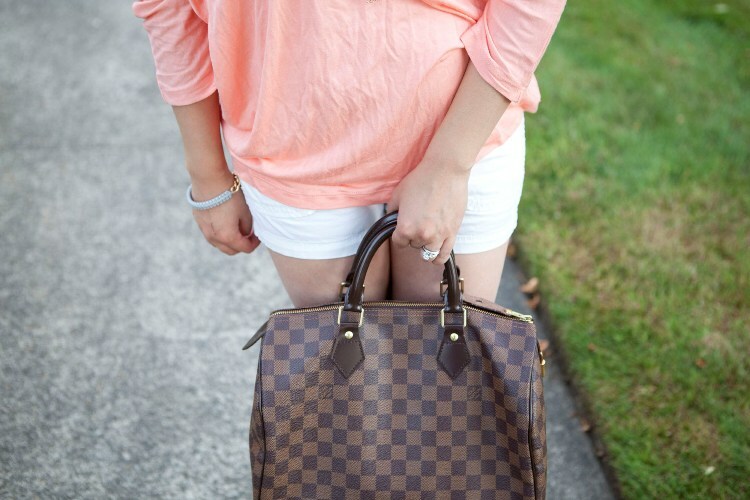 the peach color goes great with your complexion. you are too funny. i love the gold and silver mixing. you are just too cute, girl! im so horrible at following the rules..im very good at breaking all rules and mix patterns and metals! Fabulous bag.. very classic and evergreen in my opinion :) Thanks for dropping by my blog! I love your blog. We can follow each other if you want. I love the color mint! It was EVERYWHERE this summer and I still can't get enough of it! I really like your speedy, I've been contemplating whether I should invest in one and seeing this post makes me want it more and more! Thanks for stopping by my blog to leave me a nice comment :) Would you like to follow each other? That peach color is so amazing... my obsession this summer! I would probably break the tradition. 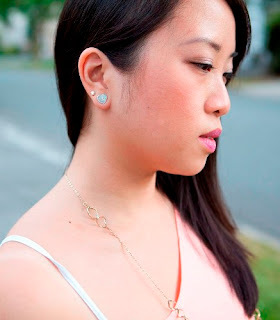 Lol I dont like to follow rules all the time, mixing jewelry is fine :D I love the coral top you're wearing~ cute color. Oh peach! Why are you so devine!??! That peach top is so pretty. I also like mixing silver and gold. I mix gold and silver too! Now a days have so much jewelry you can mix and match. 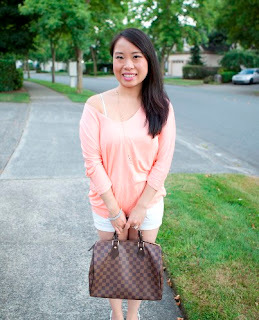 Great peachy F21 top. I actually just spotted the necklace on the F21 website as a new arrival last night. Going to try to find it again. I haven't figured out the happy medium for mixing silver and gold so I try to keep them far apart if I wear both (my Tiffany jewelry is white gold or silver and my other costume jewelry is usually gold toned). This is really cool! Please check out my blog if you can, I just made one so any feedback would be great! You are looking very pretty in this dress and your handbags is perfectly matched with your dress. Wedding Anniversary - First Year!